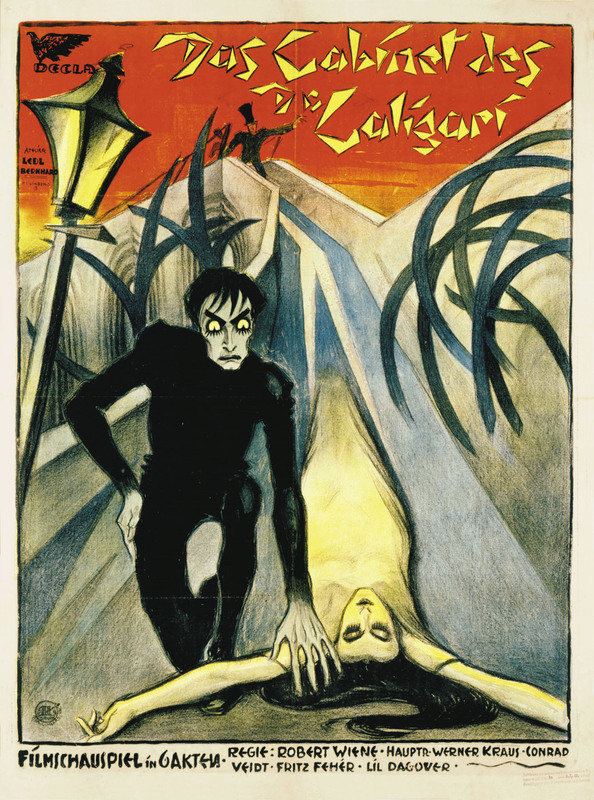 The posters were part of an innovative advertising campaign for an upcoming movie by Robert Wiene called The Cabinet of Dr. Caligari. When the film appeared, audiences were mesmerized by Wiene’s surreal tale of mystery and horror. Almost a century later, The Cabinet of Dr. Caligari is still celebrated for its rare blending of lowbrow entertainment and avant-garde art. It is frequently cited as the quintessential cinematic example of German Expressionism, with its distorted perspectives and pervasive sense of dread. Like many nightmares, Caligari had its origin in real-life events. Screenwriter Hans Janowitz had been walking late one night through a fair in Hamburg’s red-light district when he heard laughter. Turning, he saw an attractive young woman disappear behind some bushes in a park. A short time later a man emerged from the shadows and walked away. The next morning, Janowitz read in the newspapers that a young woman matching the description of the one he had seen had been murdered overnight at that very location. Haunted by the incident, Janowitz told the story to fellow writer Carl Mayer. Together they set to work writing a screenplay based on the incident, drawing also on Mayer’s unsettling experience with a psychiatrist. They imagined a strange, bespectacled man named Dr. Caligari who arrives in a small town to demonstrate his powers of hypnotism over Cesare, a sleep walker, at the local fair. A series of mysterious murders follows. In a purely cinematic sense, of course, The Cabinet of Dr. Caligari remains a revolutionary work. You can watch the complete film above, made from a 35mm print restored by the Bundesarchiv-Filmarchiv of Germany and featuring the original color tinting. The film is included in our collection of 575 Free Movies Online.